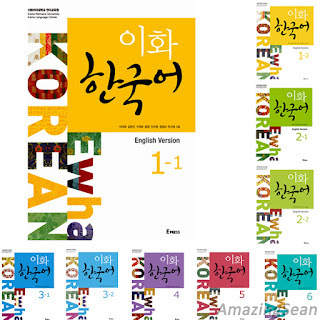 Ewha Korean (이화 한국어) is a new Korean language textbook written by Ewha Language Center at Ewha Womans University after 12 years of publishing Pathfinder in Korean. Over the past years Pathfinder in Korean has been widely used as a Korean language textbook in many countries and is still prized as a useful guide for beginners to the Korean language. Under the belief that a new textbook was called for to meet the needs of changing times, Ewha Language Center began development of Ewha Korean in 2008. The project gained momentum when it was selected for funding under the Ministry of Education, Science and Technology’s program to provide support for Korean language training in 2009. The textbook was tested, revised, and tested again through actual use in the classroom at Ewha Language Center before coming up with the final version. The Ewha Korean series consists of 27 volumes including 9 textbooks, 9 workbooks, and 9 study-guides covering six levels. Ewha Korean is a comprehensive textbook covering 4 skills of speaking, listening, reading, and writing with related content throughout all 6 levels. The new textbook is designed with an emphasis on speaking ability to encourage students to improve their conversation skills without memorization by creating their own dialogue according to a given situation and explanation of the dialogue and vocabulary. If you are living outside of Korea, you can buy the official printed Ewha Korean book series at Twochois. However, if you are living in Korean, it is recommended to buy the books at online Korean book stores for cheaper prices such as Gmarket. Here, with our best efforts, we are able to collect some of the textbooks (not all books) from different sources in the Internet. If you want to own your own book and practice book, please consider to buy the printed books as mentioned above. Otherwise, follow the links to download the ebooks for free. Finally, learning a foreign language always requires an enormous effort. I hope you can master Korean someday. Keep fighting! For downloading full Korean ebook series (PDF+Audio), please find the Yonsei Korean OR Sejong Korean , which are also available at our Korean Topik. Cheers! Can you upload the study guide?? do you have any idea where to download the missing ones?